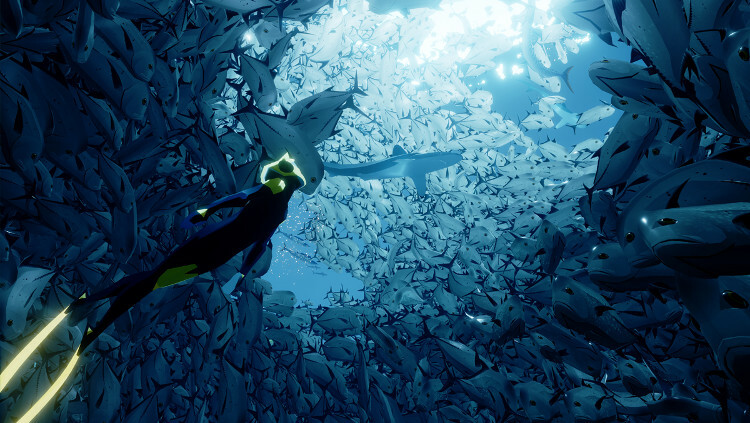 ABZU has a lot to tell players throughout its duration, but even though the game only clocks in it around 90 minutes long, the ambiguity of its narrative means that it is difficult to unpack. Developed by the 2012 indie classic Journey‘s art director Matt Nava as part of his new studio Giant Squid, players of that game won’t be surprised to hear that there’s a deeper meaning behind this otherwise peaceful exploration of the ocean’s depths, and one which it’s very likely you’ll have trouble piecing together. 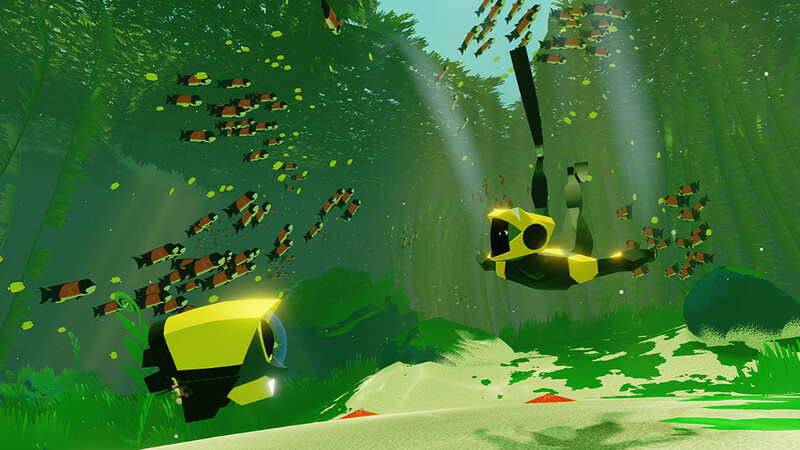 Though the first two chapters of ABZU are spent frolicking with its colorful marine life and chasing around the elusive great white shark who is leading your adventure, by the third chapter it becomes clear that all is not well under the sea thanks to the introduction of explosive, mechanical tetrahedrons, which are serving to devastate the ocean by way of harvesting the blue energy that is the source of the life within it. 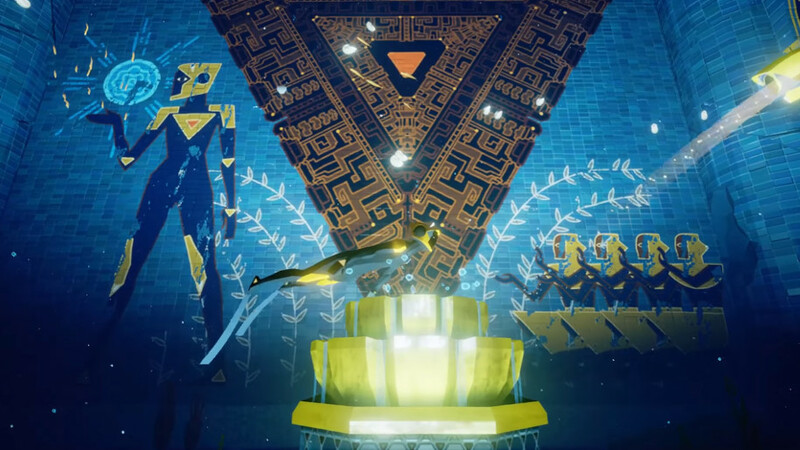 Much like Journey, ABZU‘s story is mostly relayed through murals that line the walls of various locations the Diver ventures into, with these hieroglyph-esque paintings outlining her involvement with the evil tetrahedrons. 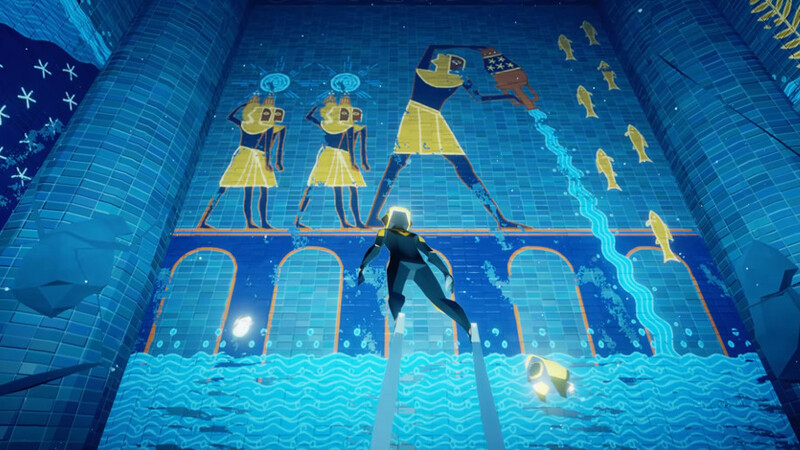 According to these murals, the Diver is a special being who is somehow affiliated with a giant pyramid that is depicted as being able to harvest the blue energy that is found in ABZU‘s waters. In the opening scene of the game, the Diver is unconscious and floating in the water, with her now years departed from the reign of the ancient civilization depicted in the murals. 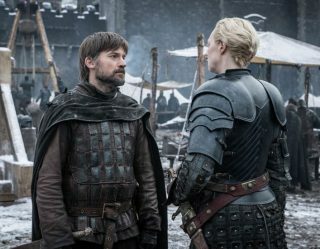 As the story progresses it becomes clear that the Diver is seeking to restore order in the ocean, returning the blue energy to its rightful home and destroying the remnants of the technology that has paved the way for such great amounts of devastation. As the final credits roll, the Diver has successfully destroyed the ship and its explosives, restoring order once again. But why was the Diver trying to harvest the blue energy in the first place? What was the purpose of the tetrahedrons? And what was the significance of the shark? 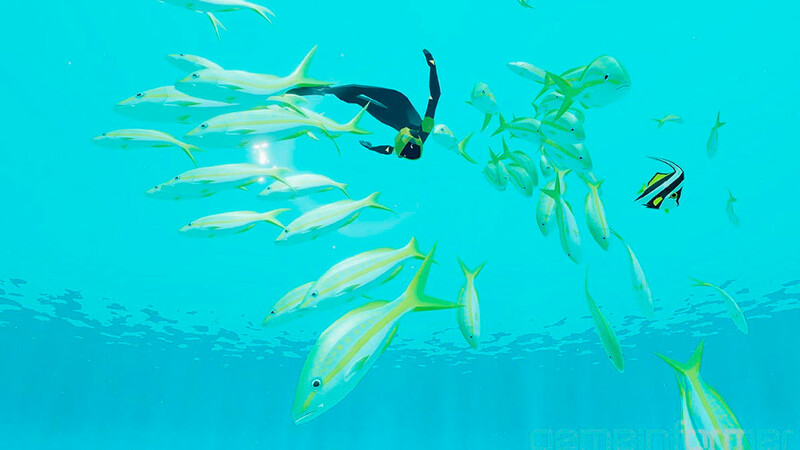 Along with swimming through open expanses of the ocean, during the course of ABZU the Diver will also encounter ancient ruins that point to a lost civilization, with the aforementioned murals lining the walls pointing towards the player-character’s position within the game’s world. In one temple, the Diver is depicted as being able to harness the invaluable blue energy from within, which is validated by her ability to actively restore life to the ocean when interacting with the wells located in ABZU‘s overworld. The blue energy being able to generate life inevitably meant that it was perceived as incredibly valuable by the denizens of the lost civilization, who are shown in the murals to be collecting it in jugs, taking enough for their own benefit but with them also shown returning it to the ocean, too, so as not to upset the balance. But then the primitive nature of this gathering exercise was interrupted by the introduction of the Diver, who is shown in the murals as arriving alongside a giant floating pyramid, surrounded by the explosive tetrahedrons found littering the ocean floor. In these paintings, the pyramid is depicted as being a giant harvester of sorts, able to collect the blue energy much more efficiently than the jugs utilized by the ancient civilization. However, the Diver is shown as the being that brings balance to this arrangement, with her possessing an innate ability to control the blue energy from within herself, ensuring that the ocean doesn’t suffer from too much blue energy being taken away from it. Unfortunately, it seems that the Diver has been M.I.A. for quite some time prior to the events of the game, with her lack of participation in the harvesting of the blue energy leading to the pyramid harvester taking away too much blue energy from the ocean, culminating in a great imbalance that has had a devastating impact on the underwater world. Where did the Diver come from? Though ABZU keeps its plot deliberately vague, one major element that isn’t really outlined at all is the origin of the Diver. In the murals she’s shown as pretty much just turning up one day, and the ancient civilization isn’t exactly capable of crafting the kind of incredible technology that can be found in the giant pyramid in the game’s fifth chapter. There’s also the issue of the revelation that the Diver is in fact an android, created by whoever was responsible for the pyramid in order to serve as a vessel for the ocean’s blue energy. It could be argued that the ancient civilization created the Diver and the pyramid in some kind of mad spurt of creative genius, but considering how primitive the rest of their equipment is, it would be quite a stretch stretch to suggest that they had not only created a giant, futuristic energy harvester, but that they were also responsible for creating artificial intelligence, too. The only possible conclusion that can be made, then, is that something from another world sent the Diver and the pyramid in order to harness the blue energy, though again the purpose of this exercise remains unclear. At various points throughout the game, the player can breach the water and see various similar pyramids floating in the sky, which is a major hint that along with their intended purpose as harvesters of the blue energy, these giant machines were also spacecraft of some kind that are capable of flight. That would explain how the Diver reached the ocean, though it doesn’t explain exactly why she’s there if the blue energy wasn’t being transferred to an alien race, but was instead still being utilized by the ancient civilization. Given how ambiguous the game is in conveying the origin of the Diver to the player, there aren’t many clues that help to explain this major loose end in its story, leaving a big question mark hanging over it. However, I do have one theory that may have some substance. Are the Diver’s creators a metaphor for humanity? 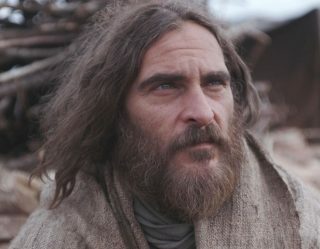 The creators of the Diver and the pyramid harvester clearly take a hands-off approach to their work, given that they unleash this major technology onto another world only for it to crash and burn, then failing to intervene as it causes chaos and leads to a major loss of life. As outlined above, ABZU has a very clear eco-friendly message that conveys the importance of maintaining balance in the ocean, with the mining of the blue energy acting as a metaphor for the resources humans mine in reality. 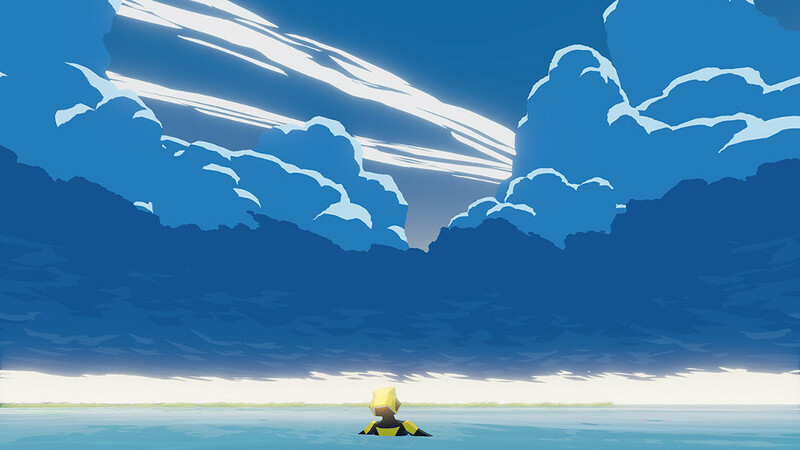 However, rather than insisting that such actions are inherently bad, ABZU instead suggests that taking away from the ocean is okay if you give back to it, too. Unfortunately, the Diver’s extended bout of unconsciousness means that nothing was being given back while the pyramid was taking away, leading to the downfall of an entire civilization and ABZU‘s ocean life heading down a similarly tragic path. This draws parallels with real-life scenarios such as the BP oil spill, in which those responsible for dealing with its extensive ramifcations for the incident’s surrounding ocean life were accused of not doing enough to prevent it from happening, failing to act appropriately after causing such a massive amount of devastation. I’m not suggesting that ABZU is a direct metaphor for this awful event, but rather that the game serves as a telling reminder of what can happen when man chooses only to take, while refusing to give back in return. The Diver’s push to rejuvenate the ocean and to return it to its original state is a redemption tale, then, allowing the Diver to right the wrongs of her creators. 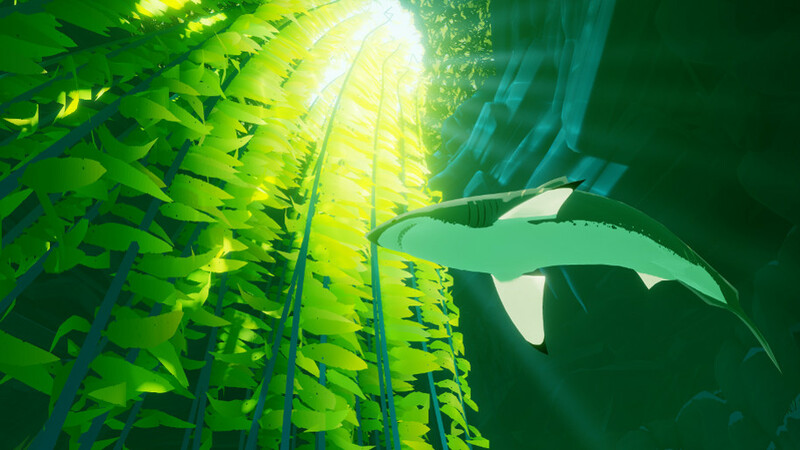 The only other “character” in ABZU is the aforementioned great white shark, which you follow around throughout your journey and, for the first couple of chapters, are led to believe that it’s the game’s antagonist given how willfully it destroys one of your little drone buddies in the early stages of the game. 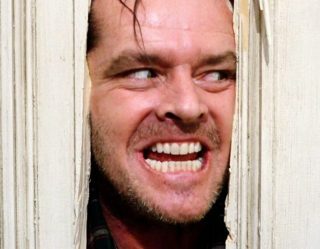 However, as the game begins steamrolling to its conclusion it becomes clear that it’s actually trying to help you – or at least possesses the same goal as you – with it finally throwing itself into the core of the giant pyramid, in a futile attempt to destroy the harvester that ultimately results in it killing itself. Judging from the murals the shark is an idolized creature that was viewed as a God of sorts, with the game’s plot adopting this stance, too. Though you’ll meet many wonderful underwater creatures throughout your time playing the game, the shark possesses an otherworldly level of intelligence which suggests that it’s a bit more screwed-on than the sharks we have on our planet. That’s not to say great whites aren’t intelligent creatures, but we’re talking Deep Blue Sea levels of knowledge here, only without the ability to swim backwards. The shark remains another big question mark in the game, with it eventually being revitalized in spirit form in order to help the player finally destroy the pyramids and bring life back to the darkest corners of the ocean. It’s not made clear whether or not the shark’s involvement in this is some part of an illusion or whether it is actually helping the player in ghost-form, but by the end credits it’s back to happily swimming about the sea alongside the Diver, suggesting that it has somehow been reborn. Regardless of whether or not the shark is an actual God or just a really clever fish, it does represent everything the wisdom of the ocean (I should also point out here that Abzu is an ancient word that means “ocean of wisdom) while also playing to our natural fears concerning the underwater predator. The moment when it snatches our drone buddy from out of the sea with its razor sharp teeth in front of us is a big jump scare, serving as one of the very few times ABZU strays from its otherwise peaceful tone. However, as we progress in the game we learn that the drones were actively working against the Diver’s goal to restore balance in the ocean, meaning that the shark was actually guiding her towards doing good. What a nice shark. An ancient civilization was utilizing the blue energy found in the ocean, which has the power to create life. One day a giant pyramid with the ability to harvest the blue energy in greater quantities appears, alongside the Diver who can store the energy inside her body. At some point the Diver becomes unconscious for a great many years – potentially thousands, even – during which time the civilization is wiped out and the pyramid has been gathering the blue energy unimpeded, destroying the ocean life surrounding it. The Diver journeys toward the pyramid in order to stop, guided by the great white. After encountering the pyramid, the great white sacrifices itself to save the ocean, but fails to do so. The player summons the spirit of the shark, before destroying the pyramid and bringing life back to the ocean. 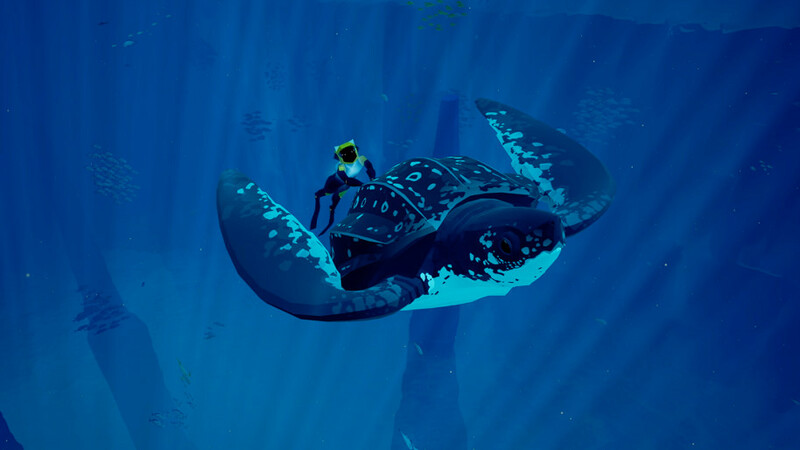 Unfortunately, the ambiguity of ABZU‘s plot means that a number of pieces of the puzzle are seemingly deliberately missing, even after extensive digging around in the game in order to uncover its secrets. For one, the reasoning behind the collapse of the game world’s civilization is unknown, while as previously mentioned it isn’t outlined exactly who/what created the Diver and the pyramid. However, even with these omissions hopefully this theory has made the game’s vague story easier to understand, and has shed some light on its thoroughly ambiguous narrative.